Citing health concerns, the Supreme Court of Israel has ruled that the nation will stop fluoridating its water supplies in 2014. It’s ironic that as one of the most developed nations in the world, the United States is slow to follow suit of other nations that recognize the dangers of feeding the population various foods and substances – like genetically modified foods and fluoride. Since 1974, fluoridated water supplies was mandatory in Israel. It seems the nation, like the U.S., thought (or pretended to think) that fluoride offered enough benefit to risk the populations health. Hoowever, Izun Hozer Association for Dissemination of Health Education and Yaacov Gurman petitioned Israel’s highest court on November 12, 2012, demanding that water fluoridation come to a halt due to not only potential health concerns, but also because fluoride provides virtually no benefit. In April 2013, the Minister of Health, Yael German, created a new regulation removing mandatory water fluoridation. Interestingly, ruling not only puts an end to not just mandatory fluoridation in Israe, but all fluoridation — mandatory or voluntary. Here’s a translation of the court ruling. 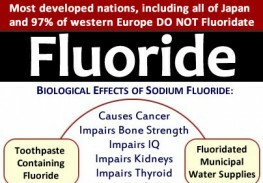 A controversial substance not utilized by many developed nations, including Japan and 97% of western Europe, fluoride is without question destroying people’s health, all under the guise of protecting the teeth. In 1977, it was shown that fluoridation caused about 10,000 cancer deaths in epidemiological studies by Dr. Dean Burk, former head of the Cytochemistry Section at the National Cancer Institute and Yiamouyiannis. The findings weren’t released until 1989. Other research highlights the fact that mass fluoride exposure may be to blame for the cardiovascular disease epidemic that takes more lives each year than cancer. In 2008, cardiovascular disease killed 17 million people. While people in the U.S. may not realize it, many nations are opposed to water fluoridation for the health-concerning reasons above and more. It’s extremely important to practice fluoride treatment protocols, detoxing the substance from your body. 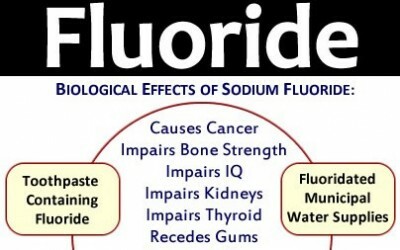 Here is a simple fluoride detox to get the poison out of your body. The antiflouridation claims are unmitigated rubbish. Humans have been ingesting natural occurring fluoride forever. Life evolved in fluoridated environments. Marine shell fish contains plenty of it. According to Prof Jim Flynn, human IQs have been increasing since IQ tests started at least. So much for the dumbing down theory. Several European nations with low natural fluoride levels supply it in salt. Many antis are also anti-vaxxers. Yiamouyiannis who antis are fond of quoting (exotic names seem to appeal to people who don’t understand the science) was never published because his research was hopelessly flawed. His work was not suppressed. He died of cancer because he refused conventional treatment. And GMO's will save mankind perhaps Stuart? As one of the rank and file with little knowledge of the science involved in the pro-fluoridation argument, I do feel however that our 'elites' have been honest or indiscreet enough to make their long term agendas concerning we lesser men abundantly clear. This being the case I naturally see all the orchestrated and destructive assaults on human relationships, lifestyles and the ultimate survival of all of us now considered to be surplus to requirements in a particularly negative light. It might be gathered from the ongoing events on our benighted planet that our Lunatic Elites, putting little faith in their ability to return as lethal viruses perhaps, have settled for the grim necessity of completely burning the house down in order to rid themselves of unwanted vermin. Put another way the parasites have decided to wage outright war on their erstwhile hosts. It is surprising that the principle argument against mandatory flouridation is that "It doesn't work". The truth is, that from the point of view of those who originally promoted the practice and support its continued use, it appears to be working just fine thank you. American Citizens are being terrorized by their own Government. European countries and countries like Israel have stopped Fluoridation, GMO's, Fertilizers, and other Health Destroying Chemicals etc. in their countries, while our U.S. Government just tells Demonic Organizations like Dow Chemical, Monsanto, Big Pharma etc. to keep Bringing it On. The U.S. government is helping to bring on the demise of U.S. citizens. And they call citizens of other nations "Terrorists". The U.S. Government hasn't looked at themselves in the mirror.